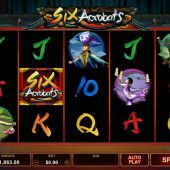 Six Acrobats slot features Oriental performers and magicians that were once employed to entertain at the Emperor's Court in China. The reels sit surrounded by curtains over a stage where they would show off their skills, spinning to the tune of some haunting eastern music and giving instrumental sounds when they produce any wins. It is reputed that the consequences of failing to please the Emperor could be severe for these characters, and as we shall see Six Acrobats may have a severe effect on our bankroll. To save you from coming to the realization after reading all the way down on here, I'll tell you now that Microgaming have again visited the Dolly The Sheep cloning laboratory and given birth to a copy of their Break Da Bank Again high-variance 9-liner. So 5 reels, 3 rows and 9-lines plus identical pays. In place of blue Sapphires we get a Red Acrobat paying 167x bet for a 5-of-a-kind win, Gold Acrobat for 111x, Green for 83x, Blue for 56x and Purple for 22x bet. Card values pay 10 down to 5.5x bet for a full line. I think you may know what I'm going to say about the game logo Wilds - yes, they appear on all 5 reels and pay 5x for any wins they appear in so 833x bet is the best line win you can get here, involving a full line of Red Acrobats and Wilds. You require 3, 4 or 5 scatters to appear anywhere in view and will get 15, 20 or 25 free games respectively. There aren't retriggers possible but every scatter appearing adds one extra spin to you total. The enhancement is that all wins pay 5x so if they involve Wild(s) you are effectively getting 25x multiplier on the values listed in the paragraph above. This means your top pay is over 4000x bet should you be fortunate enough to get the best symbol with Wild(s) over a full line.